I wanted to share with you a simple exercise that I have used this year to help keep me (mostly) motivated, (mostly) focused and (mostly) on the right track, incase it might help you too. What do I want to achieve in 2017? How do I want to feel in 2017? This was definitely the hardest thing to even begin to answer, but even having a stab at trying to answer it was quite enlightening. I had to really think about what makes me get out of bed in the morning, why do I do what I do...what is my bigger purpose..I found it very hard indeed. "I want to develop my artistic practice and push my creative boundaries so that I can inspire and help others to do the same and make the world a more colourful/joyful place"
So that was the process I followed this time last year. Just three simple questions. The What, How and Why of my year. I definitely haven't achieved everything I set out to, nowhere near, I have been more grumpy than joyful at times...I'm still writing and developing my online class, I didn't get to India (I did go to Vietnam), BUT I did find the thought process very helpful indeed. Throughout the whole year I have revisited what I said and it has given me a renewed focus and a wider context to move forward and take actions. I'm going to follow the same process for this coming year and see what changes. There is something about the start of a new year that I find very appealing. It comes with an inbuilt sense of opportunity, a sense of possibility and newness. My artwork is intuitive and intricate and often features ideas and imagery from the subconscious. I use expressive mark making to create abstract pieces which feature repetition and rhythm, layers of complexity and organic abstract imagery. I’m fascinated by the interplay of colours, shapes and patterns. My paintings are rarely envisioned but develop over days as I respond to the materials and the marks on the page, creating complex illusionary landscapes. Many of my abstract paintings are influenced by living by the sea. It strikes me that there is a powerful connection between the inspiration and the medium watercolour paint, which comes alive because of how it combines with water.Most of my work is painted in watercolour. There is something about the unpredictability of this kind of paint which I find alluring and magical. I love the way the paint and colour mixes with the water on the page and creates unexpected patterns. I love the transparency of it, the ability to build up layer after layer of paint. There’s a slight wild-childness about watercolour, it doesn’t always do what you want it to do, and I love it all the more for that. I am very lucky to have two rooms at the top of our house in Hastings. I’ve painted the walls and floor white to maximize the light. Having painted wooden floors also means I can roll back the rugs and make a real mess without any worries. I love rugs and have them everywhere, bright bursts of colour and pattern that sing to me. So, although the walls and floor of my space are white, the space is far from minimalist. I love collecting weird and wonderful objects and picking up old or unusual objects in junk shops. My place is scattered with old tins, patterned ceramics, pebbles from the beach, old books and interesting textiles. I mostly use watercolour gummed blocks. These are paper pads which are gummed on all four sides so that the paper remains taught and entirely wrinkle free. They tend to feature a little gap in the glue so that the painting can be sliced from the block with a pallet knife once completed. These types of pad allow me to use a large quantity of paint and water and for the paper to remain smooth and beautifully flat. They do not require pre stretching. I use different types of paper finish depending on the type of painting. I will use 'hot pressed' paper when adding pen detail as the paper is super smooth and allows the pen or pencil to glide along, and I will use rough or cold pressed paper if I want the finished paintings surface to be textured. I mostly use Arches Aquarelle with is aside and chlorine free and made of 100% cotton fibres for strength and stability. I use two types of watercolour paint, either Winsor & Newton Professional Watercolour Paint or Daniel Smith Extra Fine Watercolour paint. Sometimes I use tubes and sometimes I use pans (small cakes or pigment which are placed into a metal box allowing you access to several colours at once). I have used lots of different types of sketchbook over the years. I often have a small moleskine notebook in my pocket or bag. My favourite larger sketchbook thoughis a Fabriano Venezia, it has thick 200gsm paper which handles wet paint and ink really well. They come in a variety of sizes, I often use the 23cm x 30cm one. You can learn more about how I use sketchbooks here. I use black ink pens regularly in my work. I most frequently use a Rotring Isograph pen which has a metal nib and and a refillable ink reservoir. They come in different thicknesses and deliver a high definition and precise line which allows for fine detail work. I often get asked how I became an artist, so I thought I might share my story. In some ways I have always been an artist. As a child I was always drawing. I loved nothing more than spending hours creating elaborate patterns and playing with coloured pencils. I used to collect little pieces of coloured and brightly patterned paper so I could create crazy colourful collages. My love affair with coloured pencils, paints and beautiful paper has been a long and satisfying one. So if being an artist is an approach or someone who creates because that is just what they do, then that is what I have always been. As a profession though, well that's a different story. I took a rather circuitous route to get here and it is perhaps all the sweeter for it. As a child, I was always drawing. I loved spending hours creating elaborate and intricate patterns from my imagination. I used to get through so much paper that my dad started to buy me large rolls of wallpaper lining-paper to keep up with my insatiable demand for more paper. I used to have a large box in which I collected shiny and patterned papers, from sweet wrappers, pages torn from magazines, bits of shiny wrapping paper. I loved my “special paper” box, I used to like tipping it on the floor and seeing how the different patterns and colours combined with each other. So, drawing and painting was something which came innately me as a child. But I only became a full-time artist later in life. I took a rather circuitous route to get here as a profession and it is perhaps all the sweeter for it. When I was 18 I gave up studying art and I can't really understand why. I do not really believe in regrets, but this lazy decision by my teenage self is one I have questioned many times over the years. I gave it up to concentrate on more academic subjects and blithely altered my career trajectory with little thought at all. I went off to study Journalism and then completed a postgraduate degree. And then for over 15 years I had a great full-on career, working with great people in PR agencies and charities with my art and creativity as something I did away from my day job. I went to art class, after art class to help satisfy my passion. 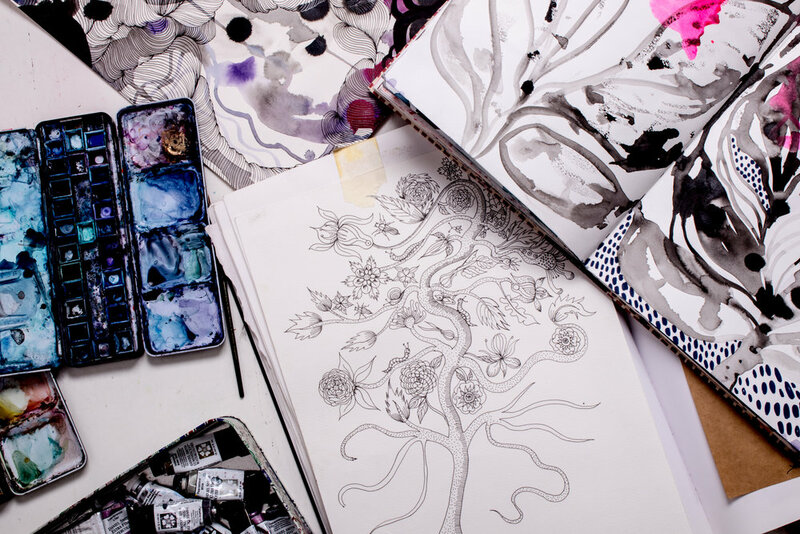 I studied printing, textiles, ceramics, collage, drawing I then completed a three year part time Fine Art course which i found so stimulating and satisfying. I thought that was enough. I was happy. I was successful in my job. I'd met and married a wonderful and inspiring man. Everything was just fine. Art was a passion not my profession. Then in my 30's out of no-where a thought occurred to me that I couldn't ignore. A thought that would change my life and my career. It was early morning in winter and I was off to meet a client for an early breakfast meeting. As I waited for my train on the still dark platform, a voice in my head said "You’re on the wrong path and you need to be an artist.” It sounds bonkers, even to me now. No one thinks like that, in the third person. But that is how it happened, it was a bit like someone was talking to me. A weird yet absolutely wonderful lightening bolt. And that was it. It was such an overwhelming sensation that I couldn’t ‘not’ do something. So I did do something. I changed-up my life. I handed in my notice at my company, where I had worked for a decade and hoped a path would become clear. I jumped without a safety net. I took action. And I started off on an amazing artistic-rollercoaster of a journey. I started painting and put some paintings online. I was astonished when I had sold one within a week. I found a new job, that was two days a week rather than the six I was working before. It gave me space and time to create, explore, experiment and make art. It also meant my husband and I could move away from London and head for the seaside. And I kept taking small yet decisive actions which together created big life changes.